Marvel's premiere super hero team, the Avengers, is currently experiencing a creative and sales renaissance unlike anything in Marvel's long history. To help satisfy the demand for all things Avengers, we`ve decided to collect the finest adventures of the current incarnation of the team. 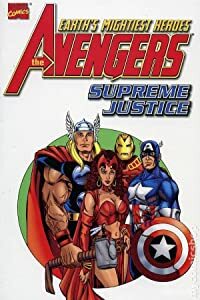 Assembled by fan favorite creators Kurt Busiek and George Pirez, heavy hitters Captain America, Thor and Iron Man are joined by the Scarlet Witch, the Vision and Warbird. The squad has also taken on junior trainees Justice and Firestar, former members of the teen super hero team, the New Warriors. Together, this roster of all-stars faces off against the evil might of the alien Kree Empire. Then it's a face-off against the Squadron Supreme, who are under the control of the maniacal Moses Magnum.